Macrophage behavior is of great interest in response to tissue injury and promotion of regeneration. With increasing numbers of zebrafish reporter-based assays, new capabilities now exist to characterize macrophage migration, and their responses to biochemical cues, such as reactive oxygen species. Real time detection of macrophage behavior in response to oxidative stress using quantitative measures is currently beyond the scope of commercially available software solutions, presenting a gap in understanding macrophage behavior. To address this gap, we developed an image analysis pipeline solution to provide real time quantitative measures of cellular kinetics and reactive oxygen species content in vivo after tissue injury. This approach, termed Zirmi, differs from current software solutions that may only provide qualitative, single image analysis, or cell tracking solutions. Zirmi is equipped with user-defined algorithm parameters to customize quantitative data measures with visualization checks for an analysis pipeline of time-based changes. Moreover, this pipeline leverages open-source PhagoSight, as an automated keyhole cell tracking solution, to avoid parallel developments and build upon readily available tools. 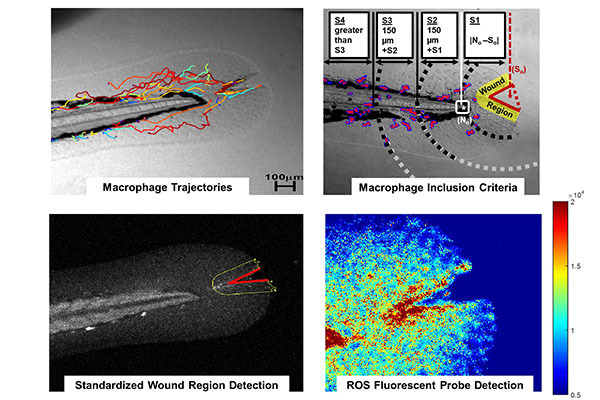 This approach demonstrated standardized space- and time-based quantitative measures of (1) fluorescent probe based oxidative stress and (2) macrophage recruitment kinetic based changes after tissue injury. Zirmi image analysis pipeline performed at execution speeds up to 10-times faster than manual image-based approaches. Automated segmentation methods were comparable to manual methods with a DICE Similarity coefficient > 0.70. Zirmi provides an open-source, quantitative, and non-generic image analysis pipeline. This strategy complements current wide-spread zebrafish strategies, for automated standardizations of analysis and data measures.